Transparency Market Research has published a new report titled, “Autonomous & Semi-autonomous Tractors Market - Global Industry Analysis, Size, Share, Growth, Trends, and Forecast, 2018 – 2026”. According to the report, the global autonomous & semi-autonomous tractors market is anticipated to surpass US$ 9 Bn by 2026, expanding at a CAGR of more than 25% during the forecast period. Market for autonomous and semi-autonomous tractor is likely to expand significantly during the forecast period, owing to the high rate of adoption of technology among farmers in order to boost the production of their farms. Specifically, the driverless tractors market is expected to expand in developed regions such as North America and Europe; however, the rate of adoption of driver-assisted tractors, which comprise steering-assist and land monitoring systems, is expected to rise remarkably in developing countries such as India, China, and Brazil. Rising population is boosting the demand for agricultural products; however, contraction in availability of agriculture land is prompting people to adopt highly advanced technologies, which can contribute to enhanced production. In the first decade of the 21st century, precision agriculture enhanced the production of farms remarkably in the U.S., which encouraged other countries in other regions to adopt advanced technologies in order to increase production of their farms and follow better land management techniques. Manufacturers are likely to focus on semi-autonomous tractors in developing countries, while the market for fully driverless tractors is likely to expand rapidly in developed countries, such as the U.S., Canada, France, and the U.K. The rate of adoption of driver-assisted autonomous tractors in developing regions is anticipated to be higher than fully autonomous tractors owing to the high cost of fully autonomous tractors. The agriculture sector is a major contributor to the global GDP (gross domestic product), and in 2014, it accounted for one-third of the global GDP. According to the World Bank, agricultural development is a highly powerful tool, which can be utilized to beat extreme poverty. Therefore, in most regions, governments are taking required steps to boost their respective agriculture sectors and manufacturers involved in the manufacturing of agricultural equipment are continuously developing equipment that can boost the production of the sector. Therefore, such development is likely to boost the autonomous & semi-autonomous tractors market. 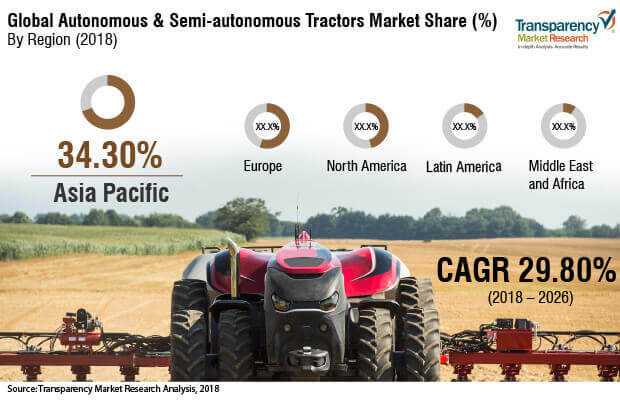 Key players operating in the global autonomous & semi-autonomous tractors market include AGCO Corporation, CLAAS KGaA GmbH, CNH Industrial N.V., Deere & Company, Escorts Limited, Mahindra & Mahindra Ltd., SAME DEUTZ-FAHR Italia S.p.A., Ag Leader Technology, Agjunction, Inc., Autonomous Solutions Inc., Raven Industries, Inc., Trimble, Inc., and YANMAR CO., LTD. Among all the players, Mahindra & Mahindra Ltd. is a leading manufacturer of the agricultural equipment and is a prominent producer of farm tractors; however, the company’s agricultural equipment business is focused in Asia Pacific, and the company is trying to expand its business units in Europe and North America. In September 2017, the company introduced its driverless tractor in Chennai, India, in order to enhance its product portfolio, and in 2018, it started production of steering-assisted tractors in India.